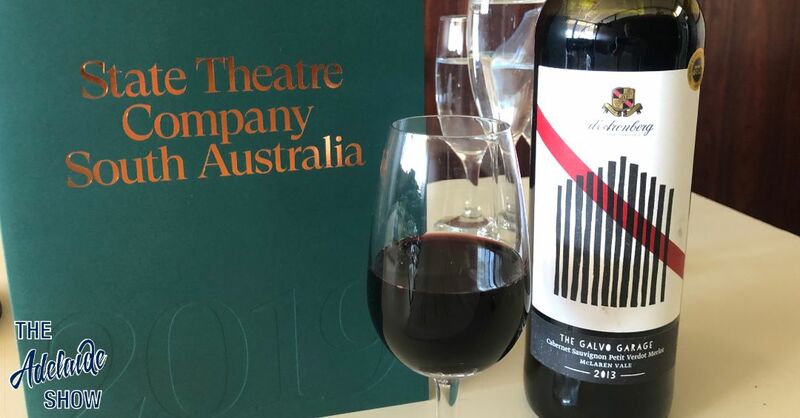 No other wine would have matched the tapestry of origins within the State Theatre Company play, The Gods Of Strangers, quite like the D’Arenberg The Galvo Garage Cabernet Blend. During our interview with artistic director of the State Theatre Company, Geordie Brookman, we revealed how the latest production involves cast members of varying backgrounds and a script in English, Greek, and Italian. What better to drink during this chat, than a wine by STC sponsor, D’Arenberg, that is itself, an interesting blend of grape varieties, namely, Cabernet Sauvignon, Petit Verdot, Merlot, and Cabernet Franc. And winemaker, Chester Osborn, has blended them well, just as Geordie Brookman blended the unique elements of his cast in The Gods Of Strangers. Geordie took centre stage in the tasting describing it as a big red but, due to the delicacy of the blend, it has a long back palate with plenty of nuance. Steve concurred, saying this wine is like a full house on opening night, with not a seat left on your palate. Geordie says Chester is one of the most extroverted and theatrical winemakers going around, hence he likes to pack a lot of character into his wines. Upon further sipping, Steve said this wine was reminiscent of the 2016 production, Things I Know To Be True; nice and fun on the mid palate but with plenty of barbs and dryness on the edges. If you haven’t tried the D’Arenberg The Galvo Garage Cabernet Blend, we recommend you do because, just like live theatre, once it’s gone, it’s gone. Listen to our extented live tasting and discussion in episode 266 of The Adelaide Show Podcast, or search for us in your favourite podcast app, or use the player below. Love your show……..fun, thought provoking, a bit whacky, informative……all round wonderful production. Thank you.